No project can be successfully completed if no project progress control tools are applied. You need to remember these words and use metrics to ensure successful project delivery. This Project Progress Checklist will help you understand how to track and report progress of your project. To ensure that every person involved in tracking and controlling project activities is aware of current indicators and knows how the project is progressing. To motivate your project team by focusing on the results achieved. To demonstrate your project management skills and educate your project team in the best review practices. Project Understanding: you need to talk to your project team and make sure every team member is aware of project goals and understands how to achieve these goals. At the first meeting, you can organize a presentation that allows the team to understand project goals. Software (like VIP Task Manager) can be used to prepare such a presentation and develop a meeting agenda. Information is Properly Gathered: you need to ensure that your team gathers right data. Nothing will de-motivate your people more than believing that they collect wrong data and use wrong metrics. Make sure you have instructed your team in information gathering, the agreed format (timesheets, verbal reports) of project progress and performance measurement, deadlines (daily or weekly reports), people responsible for collecting data. Milestones: you need to make sure your project is carried out in accordance with your milestones. If the milestones are achieved, give praise where it is due. If they are not met, examine what is stopping you from doing so. Product Quality: you need to assure and control quality of the product your project delivers. Giving not enough attention to project quality management activities may cause a considerable amount of time wasted and bad project results. For better quality management you can develop forms that include quality criteria. Risk Managing: you need to identify and track threats and uncertainties that may cause your project failing. Work with your team to identify risks and develop risk responding strategies that help eliminate or at least reduce the likelihood of risk occurrence. Project Expenditure: you need to find out whether your project is carried out over or under budget at this point in time. Can you say that it will be under budget till the project’s end? What are reasons that may cause extra expenditure? Do you think there are some reasons that may cause project failure due to the lack of financing? Change Control: you need to ensure that everyone involved in managing your project is informed of any changes occurred. Your project plan is not a static document so you should use control tools to respond to changes and agree progress updates. Value Tracking: you need to make sure your project delivers the value expected. Can you say that the project is viable and that costs do not outweigh benefits? Goals of Project Status Report. Project Status Report refers to a formal document that includes summary information on project (e.g. indicators and metrics). This document is created by your project team and submitted to your project manager. Project Status Report will be produced regularly for the purposes of project tracking and project monitoring. It addresses needs of project stakeholders which can be presented in a chart. Current and accurate data on project progress as well as metrics. Project progress for key project tasks and activities. Key third party tasks, including those tasks assigned to vendors and suppliers. 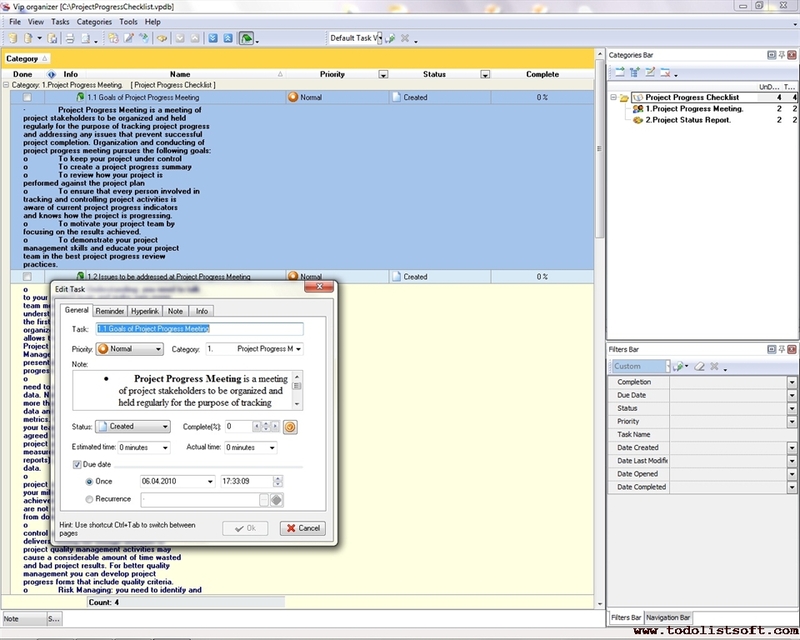 Task dependencies with related project activities. Barriers that reduce the likelihood of successful project delivery. Measurements which show what your project team does to remove barriers are also included. Descriptions of business impact and change with reference to current progress. Actions that can be taken in case if current project goes wrong. Chart template that depicts current progress regarding project deliverables.